45 Ocean, previously known as Ambassador South, is a charming oceanfront condominium complex situated directly on the sand in Highland Beach, FL. Built in the mid-1970's, 45 Ocean is comprised of two ten-story beachfront condo buildings with a total of 160 private condominium units. 45 Ocean condos offer two-bedrooms and typically range from 1,100 to 1,200 square feet in size. One of the more affordable oceanfront condo complexes in Highland Beach, condos for sale at 45 Ocean are typically priced from the mid-$300's to the high-$400's. 45 Ocean is also unique in that it is one of the few pet-friendly condominiums in Highland Beach, FL, allowing residents to own one pet up to 20 lbs. In addition to the incredible oceanfront location, 45 Ocean offers a host of resort-style amenities which residents may enjoy year round. Amenities at 45 Ocean include a sparkling beachfront swimming pool and huge paver patio with plenty of lounge chairs, tables, and umbrellas. Residents also have use of the outdoor gas barbecue grills, party room with dance floor and full kitchen, billiards room, fitness room, as well as his and hers saunas. The buildings at 45 Ocean are guard gated, and the community offers 24-hour security and secure covered parking. Located on the southeast coast of Florida just north of Boca Raton, the town of Highland Beach spans just over one square mile of land that lies between the sparkling blue waters of the Atlantic Ocean and the scenic Intracoastal Waterway. 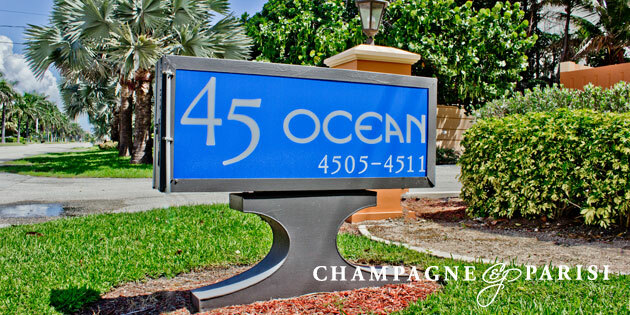 45 Ocean is situated right in the heart of Highland Beach, just steps from the pristine, white sandy beaches and in close proximity to all of the great restaurants, nightlife, entertainment venues, and shopping options in nearby Boca Raton and Delray Beach. If you would like to learn more about 45 Ocean condos or any of the other oceanfront condos for sale in Highland Beach, FL, please give us a call at 561-403-0111. You may also reach us by completing the brief online contact form provided below and one of our expert Highland Beach real estate agents will be in touch to assist you. With our East Boca Raton office located in the heart of the Boca Raton beachfront, we are your go-to resource for oceanfront condominiums for sale in Highland Beach and Boca Raton, FL!